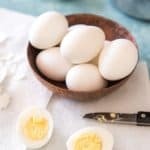 Perfect hard-boiled eggs have whites that are firm but not rubbery and yolks that are cooked and still creamy, without a layer of grey around them. This tutorial shows how to make perfect hard-boiled eggs, every time. Place the number of eggs you want to cook in the bottom of a medium to large pot in a single layer and cover them with an inch of cold water. Set the pot on the stove and turn the heat to high. Bring the water to a full, rolling boil, then cover the pot with a lid, turn off the heat, and set the timer for 12 minutes. As soon as the timer goes off, take the lid off the eggs and set them in the sink under the tap. Drain the hot water and run cold water over the eggs to cool them quickly and stop the cooking process. After a minute or two under cold water, you can drain the water and store the cooked hard-boiled eggs in a covered container in the fridge for 5 days.